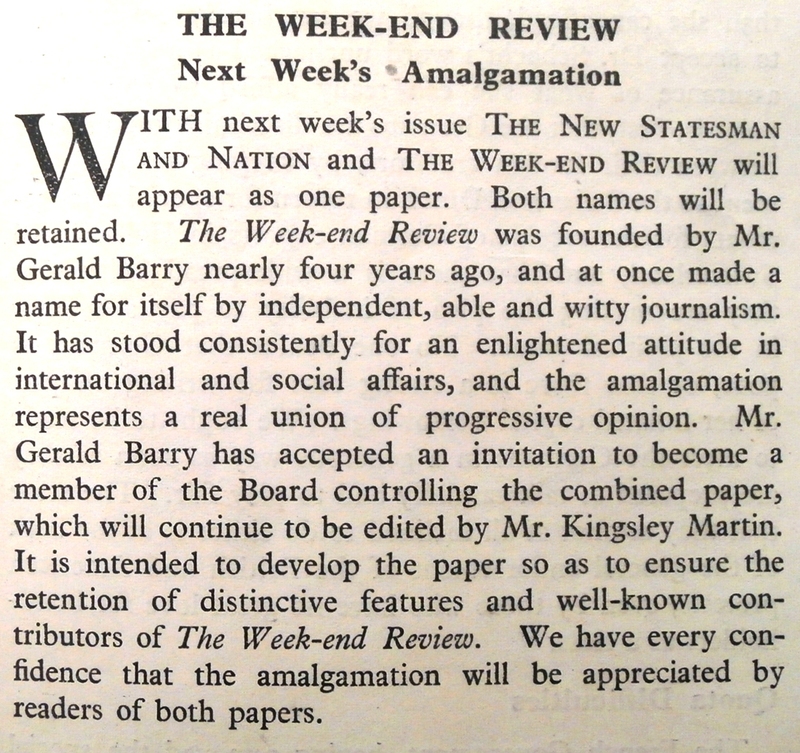 In the winter of 1917, Kingsley Martin, who was later to become editor of New Statesman not long after it absorbed The Nation and Athenaeum (itself a merger) and not long after the founding of The Week-end Review, describes conditions at Abbeville. He was a conscientious objector, working as a medical orderly. Sometimes ‘the load of wounded was not heavy’, and he describes in his first volume of memoirs, Father Figures, what he did in his leisure – everything from acting to reading. He was 19, going on 20. His political reading, he remarks, was The Nation. But what he also enjoyed, every week, in his billet on the ambulance train, was the Saturday Westminster – the Saturday edition of The Westminster Gazette, an edition which was printed on green paper, and which included literary competitions. Martin says he ‘studied [them] with delight’. (The paper was a Liberal paper founded in early 1891.) These competitions were run by the formidable Naomi Royde-Smith as they had been since the Edwardian years, in which competitors had included Rupert Brooke, Rose Macaulay, and countless other Edwardian luminaries (as well as the architect William Hodgson Burnet). The competitions were hard, ingenious, and required a good classical education, and a working knowledge or better of a number of languages, classical and modern. These competitions were the prototypes, as Martin notes, of the competitions that were, in the late 1920s and early 1930s, all the rage. Time and Tide had one. The Daily Herald had one. The Saturday Review (of course) had one. The Spectator had one. And so on. Martin, just coming out of his teens, could not have imagined that he would one day take on the longest-running competition of them all, nor indeed that he would publish Naomi Royde-Smith as a judge almost as soon as he had done so. But that is what happened. Apart from Martin, and the account given by Gerald Barry and Max Nicholson, in the last issue of the WR, there are two sources I know that describe what happened. 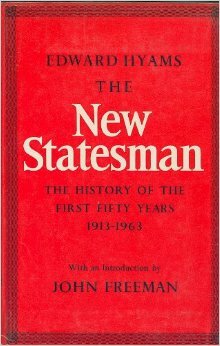 One is Edward Hyams’ history of the first fifty years of New Statesman, published in 1963. The other is the biography of Kingsley Martin – Kingsley – by C.H.Rolph, the New Statesman writer who had a curious backstory (he had been a police inspector). Rolph is nearly always more reliable than Hyams, and also a much better writer. But Rolph and Hyams and Martin and Barry/ Nicholson disagree about the detail, and Rolph is in a couple of instances quite wrong (for instance, he has Lucy, Lady Houston as the proprietor of The Saturday Review, when it was George Pinckard, and it was Pinckard who instructed the editorial team to support the United Empire Party, thereby precipitating the foundation of The Week-end Review. Houston acquired it some time between 1930 and 1932, but after the fiasco). Rolph also notes that New Statesman and Nation only took the ‘This England’ column, which he quotes at length; he doesn’t mention the competition at all. Martin himself gets it wrong – he suggests that Barry was still in charge when the United Empire Party/ Empire Free Trade Crusade editorial was published, whereas Barry had left a final issue which attacked both, and publicly dissociated himself from The Saturday Review (see here). As explained here, what did for The Week-end Review was a) the death at the end of 1931 of its enthusiastic supporter, Lady Elizabeth Courtauld, the wife of the proprietor, Samuel Courtauld, who (as Martin says) was out of step with the WR‘s increasing radicalism and b) the contempt of court case that was triggered by Clifford Sharp, Martin’s predecessor at the NS, in an article written in the WR in early 1932, an article that damaged the finances of the WR, and also cast aspersions on the co-owner William Jowitt, who happened to be Sharp’s barrister. Barry and Nicholson add a c), that it was financially unviable in the difficult conditions of the early 1930s. Nevertheless, the WR had a subscription list of 4000 (Hyams refers to a ‘circulation’ of 6000, but it looks like he’s having a wild stab at the size of the subscription list) – and Hyams notes that the business manager of the NS&N, John Roberts, thought that the l0sses at the WR were trivial, and that it was heading for a potential future profit. Its subscribers were thought to be highly loyal. Barry and Nicholson are of course circumspect about Courtauld’s role, blaming what Martin says were ‘the slump conditions’. What seems to have happened was this. A potential buyer for The Week-end Review (we don’t know who) had been found, who was willing to pay the debts of £1000 that had been run up. However, this suitor was playing hot and cold (Martin doesn’t mention this – he says John Roberts had the idea of offering to take it over. According to Ralph, Barry had Courtauld’s authority to offer it to Martin for £1000, and Barry and Martin met over lunch in late 1933 to discuss it; and Martin then consulted Roberts, with a view to taking the proposal to the NS board). As Martin puts it, and Rolph and Hyams agree, The Week-end Review had a lighter touch, and added a satirical edge to the NS, which could be over-serious. It wasn’t just the competitions and ‘This England’ (the feature Martin coveted most of all, and which still appears in New Statesman too, having, I think, been cancelled only once, in about 2006); the tone of the writing, especially in the front and political half, was livelier. The back half of the NS was not quite as conservative as the WR in its literary leanings, but both were pantomime horses. 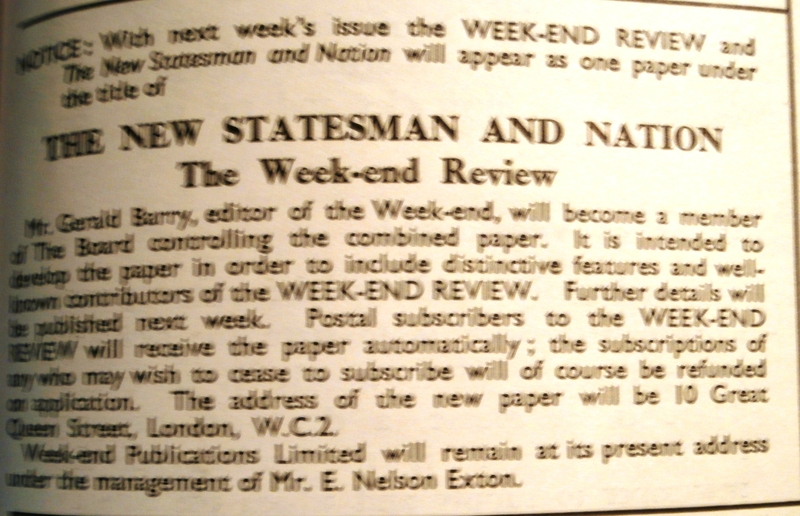 What is most amazing is that the amalgamation was accomplished within a single week, and even more remarkably, that almost none of the 4000 WR subscribers withdrew, propelling New Statesman and Nation within two years from a circulation of about 13,000 to 18,000 (or, as Hyams has it, 20,000). It is clear that the two magazines were not exactly in competition, since there appear to have been practically no subscribers to both. What must have helped is that the opening short burst of political news resembled each other in style – they looked very similar indeed. 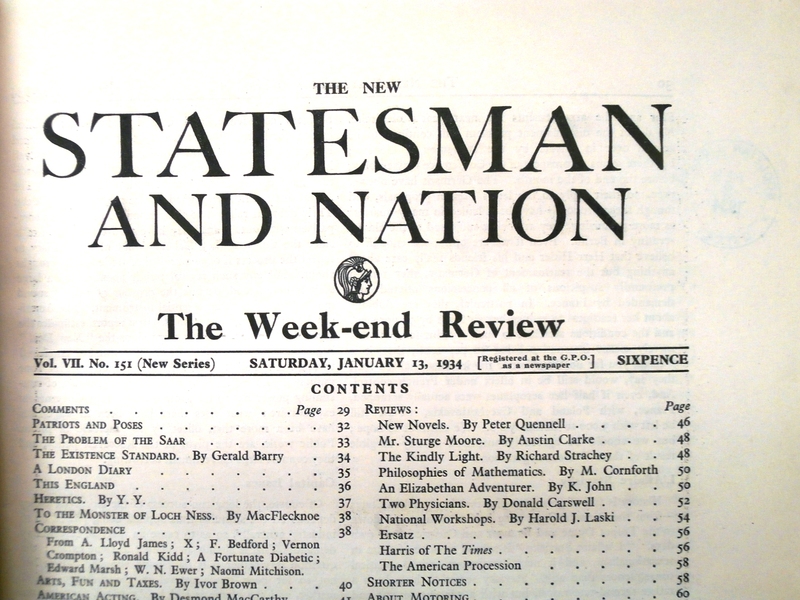 The net effect was that, to its board’s amazement, New Statesman and Nation turned in a profit and paid a dividend at the end of 1935. The boost in circulation also increased the advertising revenue, and although there were other factors at work, since the “New Statesman and Nation and Athenaeum and Week-end Review” (as it were) monopolised the liberal and radical left, it helped propel the circulation to 30,00 before the war – and lifted it to 80,000 after it. The only major feature of the WR resisted by Martin was its series of supplements on the same subject (for instance, advertising). So a new ‘omnibus’ (as Hyams called it) was born. And the competition begun in the WR, itself aping the Saturday Review, persisted and persists. The numbering simply continued from the point at which it transferred. Competitions set in the WR had judgment passed on them in the NS&N.